San Francisco is a hotbed for marketing agencies. This isn’t a big surprise, as tech companies out of Palo Alto, Silicon Valley, and the like are a big part of California’s DNA. 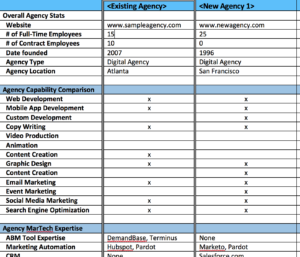 Below are three top San Francisco marketing agencies that are worth including in your next agency review. They’ve all got some great creative, as well as top marks from customer testimonials. In addition, each one has been professionally vetted by AgencyLoft staff. RNO1 is worth taking a look at for its breadth of full-service marketing offerings. Not only do they drive some beautiful creative, but they have specialization across a broad spectrum of marketing tools that modern marketing departments have come to rely upon. These tools include marketing automation, CRM and Content management solutions. They also support a full range of development platforms inclusive of languages like JAVA and .Net, and Mobile platform development tools. All that aside, here at AgencyLoft we like RNO1’s client base. They’ve supported big names like Microsoft, Google, and Facebook, but at the same time have the expertise to help grow start-ups like LOLIWARE and TryoLabs. Plus, their customer testimonials are highly favorable, illustrating a happy base. RNO1 is truly one of the top San Francisco marketing agencies worth taking a look at. Want to learn more? Check out their full profile, inclusive of creative examples, reviews, and services offered. Click here. We like Bamboo for their expertise in social promotion and advertising. They specialize in this field and have a team of agency talent that scales to support their customers from strategy design to creative development to advertising placement. Bamboo markets itself as an extension of their client’s team. This managed services approach has served them well with a nice roster of clients that include Dropbox, New York Times, Hopsy and more. They have some highly creative ads, which you’ve probably seen on Facebook or other social channels, and their client testimonials are first class. Want to learn more? Check out their full profile here. We like Bay Creative’s focus on B2B companies. They’re well positioned to help organizations looking for a full-service agency that has the expertise to support enterprise-size clients like Oracle, Salesforce and other large enterprise clients. They offer services both small and big and dedicate team members to follow their clients through the entire project. They’ll help with small projects like powerpoint creation, all the way up to the full brand and multi-touch campaigns. Of course, there are many agencies that are either headquartered or have offices out of San Fran. To review some other top San Francisco marketing agencies, visit AgencyLoft’s complete vetted agency list.